Get an emergency fund. You’ve probably heard it time and time again. Saving money is one of the most important financial habits you can develop. Emergency funds are awesome tools to have because they serve as a line of defense against unexpected expenses that could blow your budget. When it comes to determining how much to save in an emergency fund, everyone has mixed opinions. I always recommend people save 3-6 months of expenses, but I totally understand the people who strive to save a whole years’ worth of income or more. I know that some people want to save more money, but other expenses always get in the way and it’s difficult to carve out room for savings. If you need more motivation to save and grow your emergency funds, here are 4 reasons to have a large emergency fund at all times. Yes, it’s true. I’m not talking about a $2,000 4K Ultra TV that’s on sale during the holidays either. When you’re not prepared for huge unexpected expenses, they can have a negative effect on your life and change your financial future in the long run. When I was in high school, my mom gave birth to my brother. She asked my sister and her boyfriend to drive her car to the hospital for her. They ended up totaling her car and insurance wouldn’t cover it because she wasn’t the one driving. My mom had to file bankruptcy because the car wasn’t paid off and she couldn’t afford to pay the lender back. On top of that, we ended up going months without a car. It was difficult to get around and complete all my driver’s ed work at the time. If my mom had a large emergency fund at the time, she might have been able to pay the car off and break even after it was totaled. She may have had some cash to leverage with to settle the debt. Most people know about Dave Ramsey’s Baby Steps. The one I don’t agree with is his first step which is to save a $1,000 baby emergency fund. I understand that the process is all about throwing whatever you can at your debt, but having a small emergency fund is pretty scary. Yes, having a ton of debt is scary too. But, if you’re in debt and an emergency expense pops up that you can’t afford, your situation will only get worse. I admire some of the people who were able to pay off their debt at lightning speed with no savings but I know it was probably a huge risk. If you’re faced with a large expense over $1,000, you’ll need to scramble around for the extra money to pay for it or take out more debt. Nevertheless, you’ll end up having to pause your debt repayment journey as you rebuild your savings. This is why I feel it’s best to have at least one months’ income in an emergency fund at all times. If you’re a homeowner, you definitely need to have a large emergency fund. Costs for repairs and maintenance aren’t cheap and can occur at some of the worst times. When we bought our home, it was move-in ready and had some pretty good bones. However, there were a few things our inspector told us to watch out for. Our furnace had basically exceeded its life expectancy and was almost as old as me. He warned it would cost around $2,000 or more to replace it. We also realized that there were some leaks in one of the bathrooms and too much moisture in the crawl space area. We got a quote at waterdamage247.com on how much it would cost to waterproof the crawlspace and that quote was around $2,000. So already, we had $4,000 of potential repairs that no one would even be able to see. There are so many things to pay for when you have a home, so it’s best to keep as much as you can in your emergency fund so you can be prepared. Saving a lot of money has its perks. One of those perks that is often underrated is having the freedom to take advantage of more opportunities that will enhance your life. Usually, I’m a stickler for people using their emergency fund only for emergencies. However, when you save so much money and let it sit dormant for a while, you may realize that you’ve over saved. A few years ago a blogger I know realized this and decided to pay off the rest of their mortgage with some of their emergency fund money. This was a big decision that brought them so much joy. They realized they could have more cash flow now and replenish their large emergency fund anyway. Another scenario may be if you wanted to help pay for your child’s college and found out you were a bit short. If you had a large emergency fund, you can use some of your savings to help cover their college costs so they could avoid taking out student loans. If someone did that for me in college, it would have meant the world to me. All in all, having an emergency fund is one of the best perks of being financially responsible. In order to grow your savings, you need to prioritize saving money in the first place. Set aside at least one months’ worth of expenses. Then, knock out your debt and continue to save until you feel comfortable with your emergency fund balance. 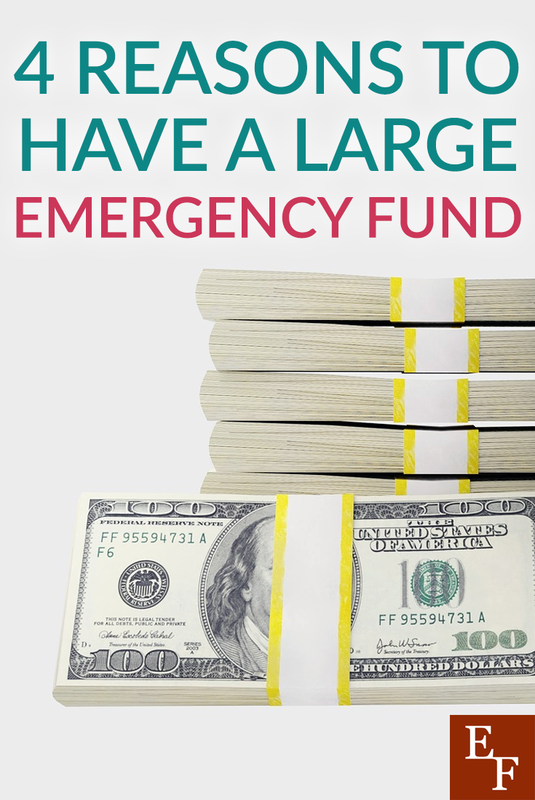 Do you have a large emergency fund? How much are you trying to save? I wouldn’t feel comfortable with just a $1000 fund. That sounds just way too little for my taste. I would rather have a $10.000 fund because you never know. Just like you mentioned, this would allow you the option of seizing any opportunities that might come along. I remember back in the day that I had some money in my fund and decided to buy some Bitcoins. The price was going up and up and I managed to sell while it was doing great so I got my money back and then some. If I’d only payed attention and bough earlier when it was dirt cheap; I would probably be a millionaire right now.